They say that no plan survives contact with the enemy. Well, it also seems that no wargames project survives with your opponent. I was musing earlier in the week about playing Sharp Practice 2, and the relatively equal cost of purchasing figures in 28mm and 15mm, especially when you are using 28mm plastics. Well, this was based on the assumption that we would be playing the Peninsular War, as both Dave and I are Napoleonics fans, and I’m also a big fan of the ‘Sharpe’ novels. Well, after a conversation with Dave Luff, it seems things are about to change. You see, we already have large British and French armies in 6mm, and Dave doesn’t really see the point of collecting another army for the same conflict in a different scale. I did suggest trying SP2 in 6mm, but this idea was given short shrift (as you will discover in the next podcast episode – #169). Apparently, Dave would like to game something away from Europe, but still be able to use our green table. This naturally leads us to the Americas, where we have a choice of the French Indian War, the American War of Independence, the American Civil War or the War of 1812. I didn’t really fancy ACW, and I’m not sure that the War of 1812 appeals that much (though I don’t know much about it, so that might change). Of the other two, I think we both gravitated more towards the FIW rather than the AWI, which makes sense to me as I do have a collection of Galloping Major figures (plus a few Foundry British Light Infantry) which I bought for use with Muskets and Tomahawks a few years ago. 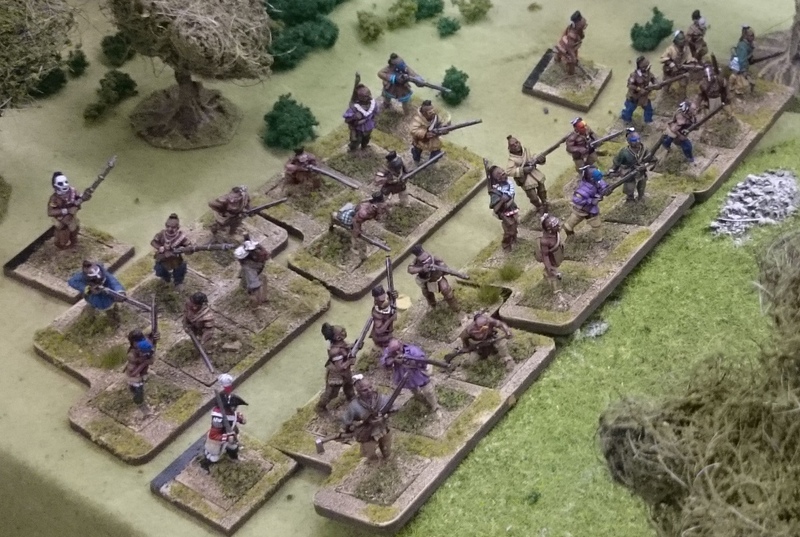 The FIW has quite a varied range of units, something that makes for an interesting game, as we discovered when we playtested the War of 1812 the other week – this variety appeals to Dave so I think this is where we are going. So, this will mean purchasing more figures (though the first job is to find the box with my existing figures in it!) Warlord Games now distribute the Conquest Miniatures range in the UK, and Front Rank figures are nice too, so we have a good selection to chose from. Obviously these are metal and therefore much more expensive than plastics, so my plan for frugality with a new project has bitten the dust! Then there is the question of scenery. We have a large number of trees, but will probably need a few more to represent the North American and Canadian forests (I reckon another 20 or so), but we will also need several buildings. Some are available in MDF, but I also really like the ones from Grand Manner – though these are rather expensive. The other option is, of course, to scratch build. Given the amount of scenery I’ve made in the last year or so, this option doesn’t hold any fear for me anymore, and I actually quite fancy the challenge of making some log cabins. Most of this is all for the future – lets see what forces are available when the rules come out on the 23rd April shall we? Not sure how many 28mm you already have, otherwise the 15mm range from Blue Moon are great and cost/space/painting time efficient too. Will work with the non-periodic terrain elements you already done for CoC. I suppose SP2 will use inches so using half ones or just play it as it is should not be a problem. You could get away with using some AWI Brits for the Regulars in plastic I think. I know you can use the WSS from Wargames Factory for Virginia Militia that was uniformed. Now the trouble is that MOST of them turned up in hunting shirts and the like. Woodland Indians come in plastic from Warlord as well. So you could save a bit.